Most people aren’t aware that lead remains a top environmental health hazard for US children. More than one in 25 American children have blood lead levels high enough to lower IQ or cause learning disabilities, violent behavior, attention-deficit disorder or hyperactivity. Lead is a metal that does not belong in the human body. During the 1970s, lead in gasoline caused severe brain damage in thousands of children. Today, lead-based paint is the most common source of lead poisoning in children in the United States (CDC, http://www.cdc.gov/nceh/Lead/tips.htm). Over many years, painted surfaces crumble and become common household dust. This dust coats the objects that curious children put in their mouths. Adults can also ingest lead in this way. It is the most common way for the lead in paint to get into a person. Children will also chew on windowsills or other painted surfaces. Sometimes they eat old paint chips. Sometimes they are exposed to lead in objects and foods imported from other countries. Deaths from lead poisoning are now rare, but it is common for a child’s blood to contain enough lead to cause intellectual and developmental delay, neurologic problems, kidney disease, and anemia. Young children are at the highest risk for lead poisoning. Children absorb 40-50 percent of the lead that gets into their mouths. Adults only absorb 10 percent. Even small amounts of lead can produce high concentrations in the blood of young children because their bodies are small. Since children’s brains are still developing, the effect of lead poisoning can be especially damaging. Children exposed to dust from lead-containing paint are the most often affected. Lead is used to make paint last longer. Before World War II, heavily lead-based paints contained as much as 40 percent lead by dry weight. The amount of lead in household paint was reduced in 1950, and reduced even further in 1978. Most apartments and houses built before 1950 still contain paint with high levels of lead, particularly on doors and around windows. Newer household paints may test positive for lead, but generally contain much smaller amounts. Lead levels in paints are measured in parts per million (ppm). You will need to find the concentration of lead in your paint to determine the level of risk. Currently, 600 ppm of lead is allowed in paint, since this much should not produce toxic levels in a child who eats it. If a chip contains 5,000 ppm or more, something must be done to make the area safe. Other sources of lead include some types of glazed ceramics, fumes from burning batteries, some Asian cosmetics, and dust carried home by those whose work or hobby involves lead. Some traditional folk remedies may contain lead. For example, Azarcon and Greta are powdered folk remedies often used in Latin American countries for “empacho” (intestinal illness) but have been found to be almost 100% lead! Lead has also been found in some imported candies and in some antique furniture and metallic toys (Journal of Environmental Health, 70(10):80, 86, 2008). Dangerous lead levels are most common among the inner city poor. Blood lead levels over 10 micrograms/dL can damage the brain. Children with levels up to 7 times that high might have no obvious symptoms while the damage is being done. Severe lead poisoning can cause persistent vomiting, seizures, coma, and death. At lower levels, the child might have anemia, abdominal pain, severe colic, attention problems, hyperactivity, learning disabilities, or mental retardation. How long does lead poisoning last? Lead will continue to accumulate as long as the child is being exposed. The damage from the lead can be permanent. Lead poisoning is best diagnosed with a blood test – before symptoms are obvious. This is especially true for children with anemia. The risk of lead poisoning should be assessed during well-child visits, especially for children under age 2. The treatment varies depending on the degree of poisoning. Sometimes emergency medical treatment is necessary. In some cases medicines are given to reduce lead levels. In all cases, the source of lead should be identified and the child protected from exposure. Learn whether or not any paint near your child is likely to be contaminated with lead. If there is any question, it is wise not to place a crib, playpen, or high chair where paint is peeling or can be chewed. Keep the home as dust- free as possible by regularly wet-mopping the floors. In particular, wipe windowsills with water and a household detergent. Paint samples can be tested for lead. A common response to a positive lead test is to strip the old paint. DON’T. The process of removing old paint (especially sanding, scraping or burning) can produce large amounts of lead dust. 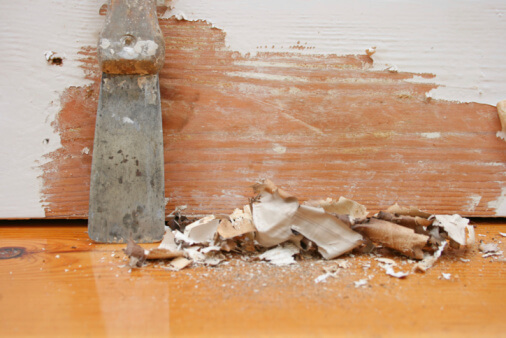 Lead poisoning is very common during remodeling. Use a contractor skilled in lead abatement to enclose or remove the lead from your home. For information on finding such a contractor, and finding local laboratories that can test lead concentration in your home or apartment, contact your local Health Department and ask for the Department of Environmental Health. Another great resource is the National Lead Information Center at 1-800-424-LEAD. Lead specialists are available through this hotline to answer your questions and will send you detailed information on preventing lead poisoning. In addition, good nutrition (fresh fruits and vegetables, plenty of calcium and iron) causes less lead to be absorbed into the body. And the lead that is absorbed will do less damage.